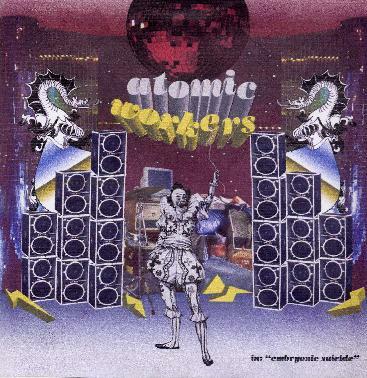 Atomic Workers - "Embryonic Suicide"
This is an interesting new psych rock project from the guys in That's All Folks and Gary Ramon (Sundial). The band was the idea of bassists Michele Rossieloo (That's all Folks). They recorded their record at Gary Ramon's Third Eye studios in Hastings, England in 2003. The opening track and title is very much a throwback to the late 60's. The vocal really reminds me of someone but I just can't place it. A very 60's garage production and cool guitar playing. "No Reaction" is a quite hard hitting psych rocker that gets quite spaced out in the middle. "White" is nearly 9 minutes and finished the first side of the record. It is slow to get started but features a quite psyched out organ and guitar. Cool song. "Plastic Man" starts side 2 and built upon a heavy bass line and it kind of goes into a jam before dying out. Next is a good cover version of the "Hurdy Gurdy Man" (Donavan). "Down on Earth" is next and begins with a bit of a drone and quite spacey as the track begins to build. This is a total psychedelic head trip for the first 2½ minutes and then the band appears to snap out of it, but no... back to the freaking out. "Far Away" is next and is the last track and completely instrumental and a heavy psych track again. An untitled far out wah wah guitar jam freakout lasting 9 minutes ends the promo CD version (and is not listed on the artwork). Great stuff. Email Atomic Workers at: atomicworkers@aol.com.